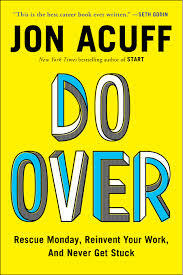 Speaker and author Jon Acuff’s most recent bestseller is Do Over. This book gives solid advice about how to get unstuck in your career. You may not find any new ideas for a Do Over if you have been forced to recover from a layoff or have successfully rebooted your career; however, he gives an ample helping of good career advice and his sense of humor makes the book easy reading. Jon introduces the concept of a Career Savings Account (CSA). He structures the book around building your CSA and then activating it when you need it to make a move. Business and career writers are compelled to create a matrix or two to lend an air of expertise to their advice. Jon’s matrix is all about the typical reboots needed in a Do Over. Jon Acuff illustrating a point. Acuff has good ideas for all of the elements of a CSA, especially hustle. Indeed I have participated in Jon’s “30 Days of Hustle” support group on Facebook. In this post, I am focusing on the role of character. Character is a recurring theme in leadership literature but is often given short-shrift in business and career advice. It is not easy to help people without it to get some when a crisis hits. And in our capitalist system there are more rewards for the character-challenged, at least in the short term. Recently I watched the documentary Slaying the Badger on Netflix. It tells the story of Bernard Hinault and Greg LeMond, two teammates who competed for the yellow jersey in the Tour de France in the mid-1980s. Normally there is one team leader in cycling and the team’s agenda is to ensure his victory for the general classification. Climbing and sprinting stars are expected to pursue their personal goals only after the team leader’s goals have been served. Most of 9 team members are called “domestiques” because of their servant role. Bernard Hinault was showing signs of weakness in the 1985 Tour de France and his young teammate Greg LeMond who was the stronger rider that year was ordered to continue to serve the team leader rather than pursue the personal glory that was within his grasp. It was widely understood by the press and other teams that probably some deal was struck whereby the following year Hinault would work for LeMond’s victory. But in 1986 Hinault was feeling stronger and he essentially backed out of his deal. He justifies it in many ways, such as “There are no gifts (give away wins) in cycling.” Ultimately his character was revealed. Depending on your values you admire Hinault for his competitive spirit or you frown at his inability to keep his word. One of The Four Agreements (Don Miguel Ruiz) is “Be impeccable with your word.” This is a hard standard to keep and yet one of a highly prized character traits among many people. Quakers have a Testimony of Truth that is essentially the same: let your yes be yes, and your no be no. The challenge is to do the work to figure out what elements of character matter to you and to make the long-term investments to make these non-negotiable in your life. I spent a lot of time in my 20s and 30s holding everyone to my standards and being crushed when people did not honor my code. When I participated in the California Agriculture Leadership Program I was bewildered by smart and capable people not seeing the same fatal flaws I could see in other people’s characters. In the same leadership program we met with Leon Panetta while he was serving as President Clinton’s Chief of Staff. I remember him saying that you have to act in such a way that you can look at yourself in the mirror and have no recriminations or regrets. I returned to that wisdom over the years as I learned from experience that there is no way we can reach a consensus on these values in such a diverse society. It has helped me to hold true to myself when under pressure. Do you know the strength of your character?